I really hate the BGG base sometimes. It's Matt from Space Cats Peace Turtles. I'm messaging you today because you've been one of our consistent posters on SCPT forum threads and I needed to reach out to as many members of the team as I could. Last week, just before the release of TI4, BGG decided it would no longer allow us to post our discussions into the General TI4 forums. They see it too much as promotion for ourselves, and less of what we see it as: the vehicle for all the exciting conversations we've had over the past ten weeks. Instead, we saw no input from the influx of new users to our forums, and instead have been bogged down in threads about "is TI4 worth it?" and "I didn't get a preorder bonus from my FLGS." We want to keep having conversations with you all, but we have to change how we do it. The BGG admin's instructed me to start a Guild, and this is where we first need your help. I'm not extremely well versed in BGG, but I know I need 10 gold to start a guild. I can only get this through adding content to the site, but the forum posts and Podcast content provided so far does not count. We're still trying to get our podcast listed on the BGG database, and hopefully this will help this process, but in general BGG seems to be more keen to hinder our independent podcast than help it. 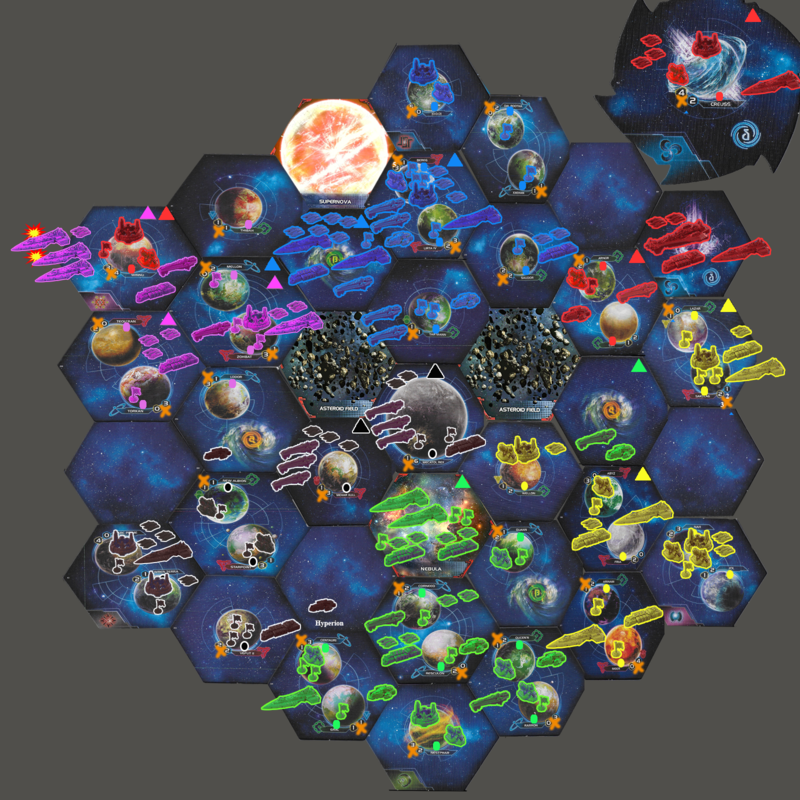 This message is getting long, so I'll get succinct: If you want to keep taking part in our conversations, you'll have to join us over on reddit.com/r/twilightimperium. The moderators there have been incredibly welcoming and enjoy letting our conversations flourish. Until we can get over all of these hurdles BGG has put in our way, reddit, Facebook, Twitter, and email are the only ways to join in the conversation. We're so sorry this is the case, and we hope you'll bear with us. Yeah, they mentioned something about that on the podcast, and it is beyond stupid. Winnu plays Flank speed. 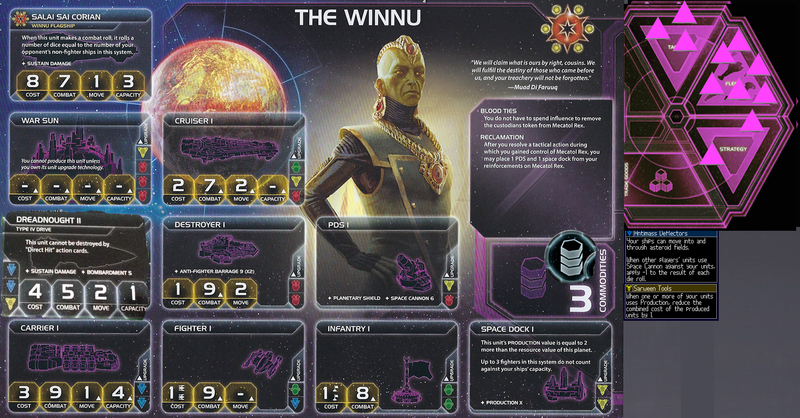 Activate Winnu system. 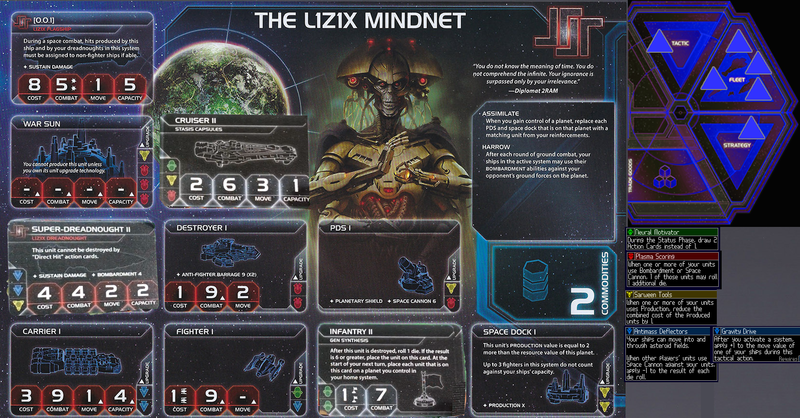 Carrier from Lodor With both Fighter and the GF moves through Zohbat and pick up another GF than goes in to Winnu. From Zhobat both Dreadnoght (1 carrying a GF the other carring a fighter) and a Cruiser move to Winnu and finally the drednought and GF from Thibah move in too. 2 winnu dreads damaged. Creuss loses 4 fighters. Winnu loses 4 infantry. Creuss loses 2. L1z1x Activate the Bereg-Lirta IV system. (TP 1 --> 0). Exhaust Bereg (5R), Saudor (2R), Tar'Mann (1R), +1R from Sarween Tools to build 1 Super-Dreadnought II (4R), 1 Cruiser (2R), 1 Destroyer (1R), 2 Fighters (1R), and 2 Infantry (1R) at Bereg. Creuss Place 1 PDS on Creuss. Place 1 PDS on Arnor. Arborec take secondary. Place PDS on Centauri. Jol Nar Play L1z1x promissory note: Cybernetic Enhancements- Remove 1 token from the L1z1x player's strategy pool and return it to his reinforcements. Then, place 1 command token from your reinforcements in your strategy pool. Then return this card to the L1z1x player. 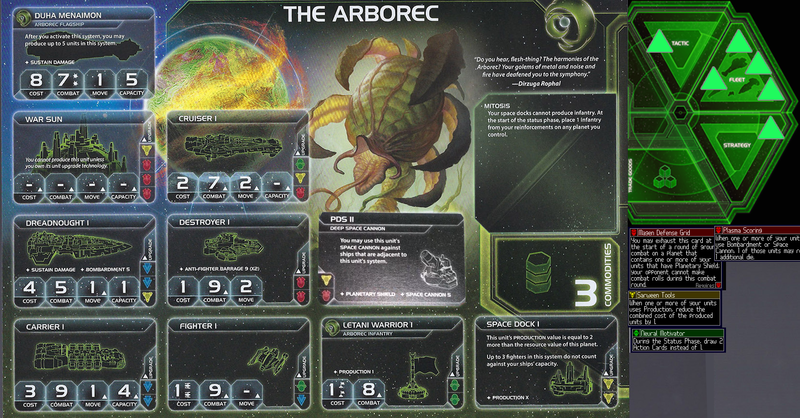 Arborec activate Nebula. Move Carrier + 2 fighters + 1 infantry from Corneeo into Nebula. Move Carrier + 2 fighters + 1 infantry from Quann into Nebula.Move Dreadnought from Quann into Nebula. Spend 1 trade good and exhaust Qucen'n and Quann. Build two one infantry and a Dreadnought in Nebula. Arborec exhuast Centauri, Rarron, and Corneeo and 1 TG. 2 Tactics, 1 strategy. Letnev Exhaust Mehar Kull, the 1/1(New Albion), and Vefut II. 1 Strategy, 1 Tactics. L1z1x plays Politics. Claiming the Speaker token. One agenda card on top, other to bottom. Jol Nar plays Trade. +3 TG. Refresh. Creuss free refresh. Jol Nar cashes their trade note in. Arborec free refresh. Jol Nar cashes their trade note. Arborec activate the alpha wormhole between Jol-Nar space and Cruess space. 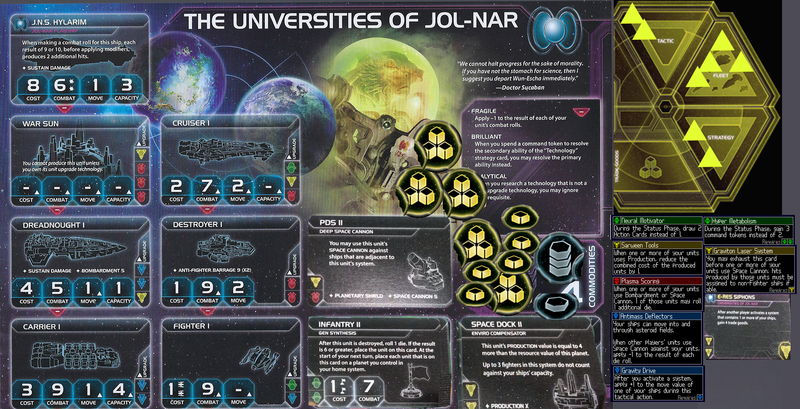 Move Cruiser and Destroyer from the empty space tile above Jol-Nar to the Alpha Wormhole. Give Arborec Trade Agreement to Jol-Nar. 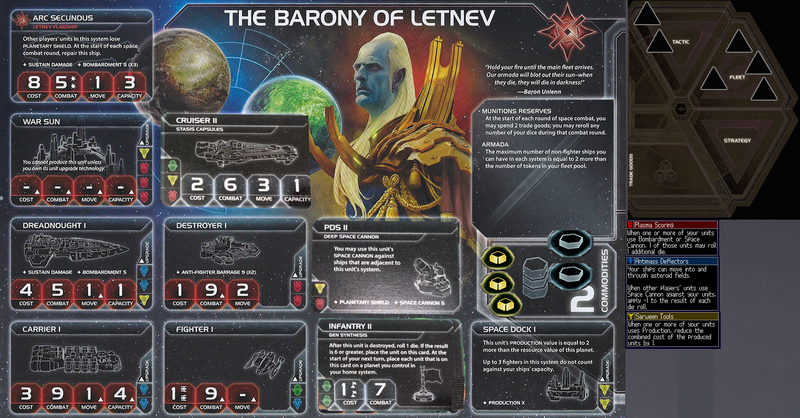 Letnev plays ghost ship. Destroyer to Winnu wormhole. Winnu Activate Mellon/Zohbat. Exaust Zohbat and Teq'ran to buy a dreadnought, 2 fighter and 2 GF. Committee Formation- Law- Before players vote on an agenda to elect a player, the owner of this card may choose a player to become elected instead. Yeah, nothing left that I want to do this round. Pass turn. You skipped on of my actions. Just before leadership, right after Nebula. My forces retreated to the wormhole on the main map, north of Sakulag, not to Creuss. 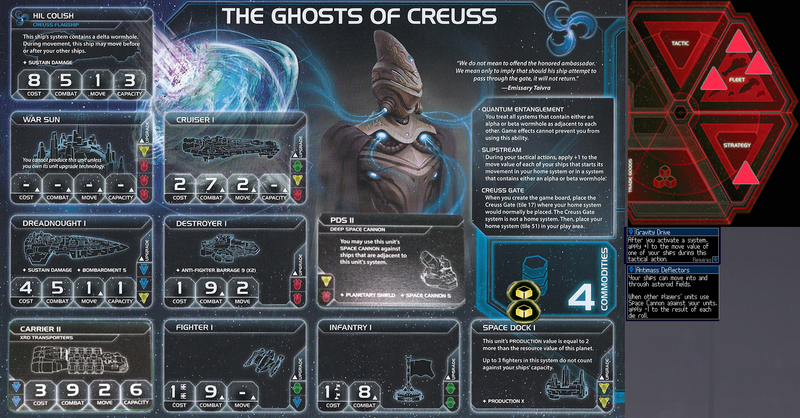 Retreating to Creuss violates my fleet limit. @Hedgethorn is able to make a PDS shot on the original fighter in that system. There should be one less gf on Zohbat and one more on Mellon. Spend a token, draw a secret objective. also, @Brody there was an issue where I have you as having researched infantry II but I think you mentioned you never researched it. Did you ever get it off of Jol-Nar's research treaty? I have never had Jol narrs agreement, and don't have the pre reqs to research it myself. Oh, also, Preda, would you be interested in trading commodities? 2 for 2? Excange 2 commodities for 2 commodities with LetNev. Pass on taking a card I can't score. @Preda only public objectives cannot be scored while a homeworld is occupied. I'll grab the Spend 5 Trade Goods objective and pass things along. I believe at that point everyone but @Mojo_Jojo and I have passed. @Preda has not yet passed his tactical phases. He can also change his mind on taking a secret objective, now knowing that you can still score them with an occupied homeworld. OK, Let's Take the secondary instead, than preemptively pass for my turn. I claimed it as part of the imperial card. Hah hah hah ... Hahah ahahahah! You guys. This secret objective I just got? Is it "Lose your home planet"? Although I wouldn't worry too much. Mojo has to realize that he is vastly outnumbered by Arborecc and pillaging the neighbor will leave him rather exposed. Is it the win a battle with your flagship one? It is, isn't it? Unfortunately, Mojo's got the Plant's Cease Fire, which makes it at least a 2 Tactical counter cost for them to invade. And, of course, Arborec's still cozying up to my planets. I suspect they'll end up just dividing them up between them. Activate the alpha wormhole between Jol-Nar space and Cruess space. 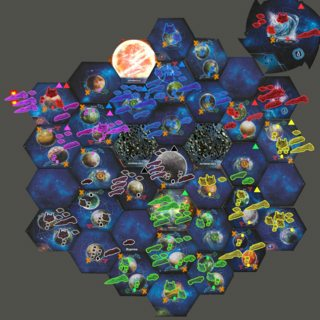 Move my Cruiser and Destroyer from the empty space tile above Jol-Nar to the Alpha Wormhole. I should've been able to take a PDS shot here, since I've got a PDS2 in the Arnor-Lor system. @MrBody / @Hedgethorn is it too late? @Elvenshae Sorry, Cruess; I wasn't trying to slip that one by you. I didn't see you had PDS 2. I think it's only fair to let you take a shot, unless @MrBody objects. Yeah, I didn't think you were. So the Imperial card and Jol-Nar's 2 build actions were the only things done after the update. I don't think we need a new update to proceed but let me know.